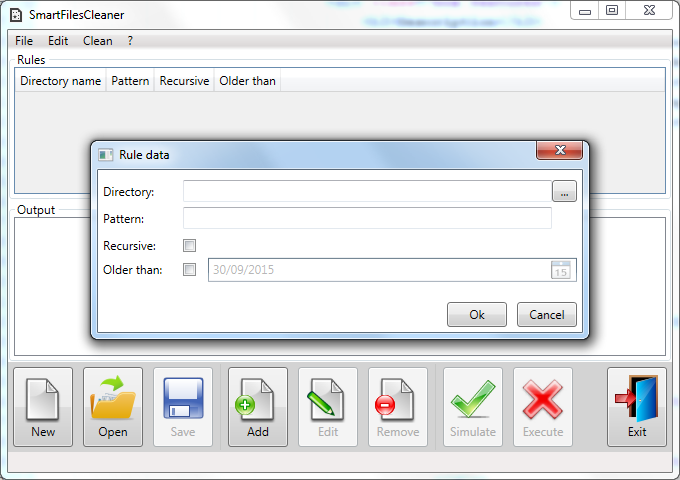 SmartFilesCleaner is a simple desktop application that allows to automatically delete files from your PC or storage devices simply defining a serie of rules. To define a rule simply to select the directory path where to delete the files, the files search pattern (e.g. *.tmp) if the operation is recursive (i.e. the program deletes the files also in the sub directories) and if the files to delete must be older than a specified date. You can download SmartFilesCleaner for free. Download. The program allows to define a serie of rules for delete the undesidered files from your archives. Directory: The directory where to delete the files. Pattern: The files search pattern. E.g. : if you want to delete all the files with extension tmp you can use the search pattern *.tmp, where the asterisk ('*') means 'all file names', the dot ('.') is the separator from the file name and the file extension, and 'tmp' is the file extension. Recursive: The program searches also in the subdirectories. Older than: The program deletes only the files that have a date older than the specified one. To edit or delete a defined rule, click the relative row in the Rule list and then press the button Edit or Remove. 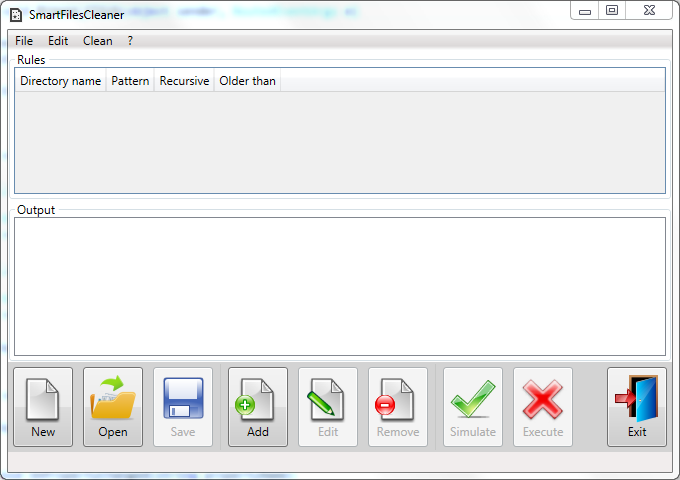 Once defined your rules, press the Simulate button to verify what files the programm will deletes. Then, to really delete the files, press the Execute button. The buttons Save and Open allow to save the rules to disk or to load them from a file previously saved.